At startup installed zip at C:\xampp\htdocs\CMS\CI\FUEL-CMS-master got welcome screen at http://localhost/CMS/CI/FUEL-CMS-master/ after changed some attributes as instructions said like never got welcome screen again... chrome browser but when opened IE11 http://localhost/CMS/CI/FUEL-CMS-master/fuel/login/ here appear login possibly due to cookies in Chrome not appear ... but welcome screen like http://localhost/CMS/CI/FUEL-CMS-master/ same message as chrome below... any help please? // path to the fuel admin from the web base directory... MUST HAVE TRAILING SLASH! // options are cms, views, and auto. // not published, it will then check for the corresponding view file. 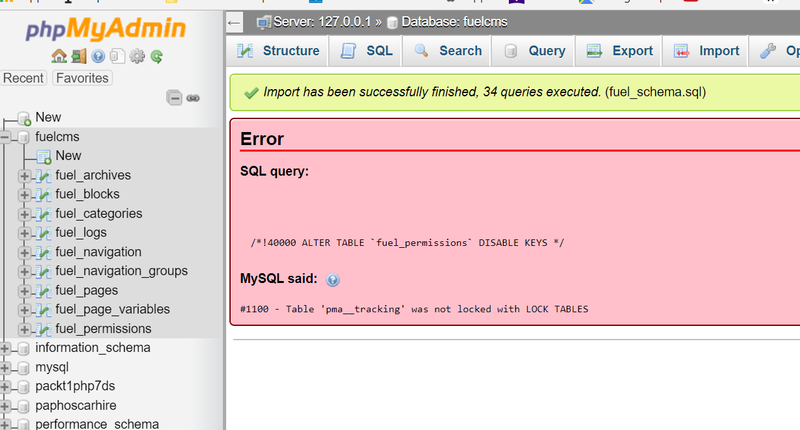 Does your fuelcms database have tables in it and in particular the fuel_users table? Looks like not all the tables have been loaded. Try dropping all the tables (assuming you haven't added anything to them yet) and loading in the fuel/install/fuel_schema.sql file again. Remove line 161 and 204 in the fuel_schema.sql file and try.